Prince William Taking Two Huge Steps To Become The 'Masonic Christ'! Title: Prince William Taking Two Huge Steps To Become The "Masonic Christ"! Subtitle: Step 1 - In line with our belief that Antichrist will come from the House of Windsor, Prince William joined the "Order of the Garter", a secret society formed in 1348 which has long exercised great control over the global Illuminati. Step 2 - Prince Charles and Queen Elizabeth II announce plans to put Prince William through an unprecedented course on how to be a King -- a course of training never done before in all England's long history! Is William going to be trained to be Antichrist, the coming "Man of Lawlessness"? In June, Prince William was inaugurated into the Order of the Garter! As you will soon discover, this is one very big step toward him becoming Antichrist one day. "Prince William’s Knight of the Garter crest has been revealed for the first time - complete with a touching tribute to his late mother. For the first time in Royal history the identifying symbol on the crest has incorporated the mother’s family logo. It is understood both William and Harry requested the simple symbol of a scallop shell to feature on both their crests and Coat of Arms. The scallop is the symbol for the Spencer family Coat of Arms and was Princess Diana’s as well." I find it very touching that Prince William is this devoted to his mother, Princess Diana; Prince Charles certainly seemed to have his knives out for Diana all the time, as did most of the current House of Windsor. In fact, many millions of people throughout the world who loved Diana will always be incensed against Charles for his treatment of her, and many will continue to believe that he somehow had a hand in her tragic death. Notice from the above picture, Aphrodite/Venus is shown coming out of the seashell, that is, being "born into existence" in much the same way that Buddhism teaches that Buddha was born out of the Oriental Lotus. 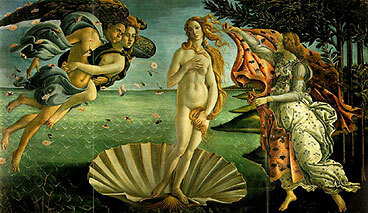 In fact, the scallop seashell is equal to the Lotus and, as such, represents both Venus/Aphrodite. Occult writings teach that Venus is considered to be Lucifer. Listen to Dr. Cathy Burns explain. Dr. Cathy Burns firmly links Aphrodite with Venus -- they are the same type of goddess! 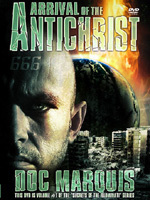 Then, as we explain in NEWS2275, entitled, "2012 - Is This The Year When Antichrist Might Arise? ", Prince William will turn 30 years of age on 21 June 2012. Why is this particular age important? The age of 30 is the Jewish minimum age for a man to be a Rabbi. Therefore, if Prince William is to convince the Jewish Orthodox priests and the Jewish people that he is their long-awaited Messiah, he must be at least 30 years of age. Now you know why Royal doctors induced Princess Diana so she would give birth to William precisely on Summer Solstice, 21 June 1982! Now, let us return to our Daily Mail news article, above, reporting that Prince William was formally inducted into the prestigious Illuminati society, known as the Order of the Garter. 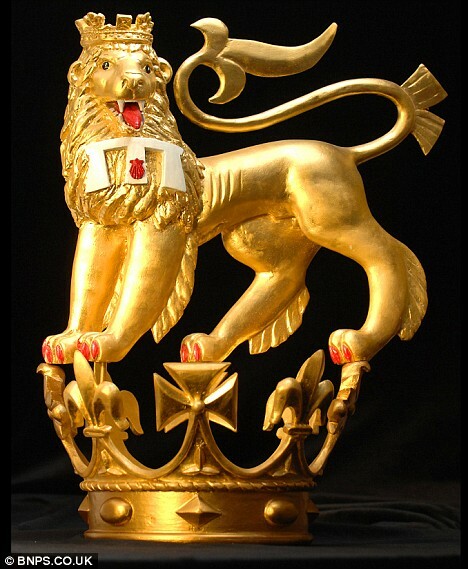 "William’s crest, which features a gold lion stood on a crown, will now be mounted above his seat at St George’s Chapel at Windsor Castle. The second-in-line to the throne was last month installed as a Knight of the Garter, the world’s oldest surviving order of chivalry." Since few people know much about the Order of the Garter, nor how important it is to the Illuminati, let us study significant portions of the write-up from Cohen's book, "Antichrist and A Cup of Tea". You will be surprised at how big of a deal it was that William was inducted into this Order. As this news article states, the Garter is "the world’s oldest surviving order of chivalry." This is entirely true. It is also the most important of the many order of knights in Great Britain. Notice that Cohen places the word 'Christian' in quotation marks, denoting that he does not believe that the Order of the Garter is genuinely Christian in any way, shape or form. You will soon see why Cohen believes that this Order is Satanic, not Christian! These 24 elders sit on their thrones with God the Father and God the Son (Jesus) seated on their thrones. Thus, it seems logical that this Order of the Garter organization of 24 Knights "plus the King and his eldest son" is mimicking the similar arrangement of thrones in Heaven. Satan has always loved to mimick God in all matters, so we should not be too surprised about this particular organizational structure! 4) What kind of an organization is the "Order of the Garter"? Of course, the Bible absolutely forbids mixing the profane with that which is holy in God's sight. God killed priests in the Old Testament who mixed the profane and the holy in the Tabernacle. Here we see that the rituals of the Order of the Garter are said to be mixing the holy and the profane, which is exceedingly typical of the Satanic Secret Societies of the Illuminati. Antichrist will perform the ultimate abomination of mixing the holy and the profane, when he enters into the Holy of Holies and defames it in the manner described in Daniel 9:27 and by our Lord in Matthew 24:15-22, an act of introducing the profane in the Holy Place which shall cause God to unleash His most fearsome of all judgments. In fact, Matthew 24:21, Jesus tells us that the anger which God feels from Antichrist's actions will produce the "great tribulation, such as was not since the beginning of the world to this time, no, nor ever shall be." Therefore, it is a very big prophetic deal for a secret society like the Order of the Garter to "mix the holy and the profane"! Now, let us examine the role of the Order of the Garter in the world of the Illuminati, those men and women who are "Illuminized" by Masonic or other secret society rituals to become the "Perfected Man" capable of finally bringing the peoples of the world into the Luciferic New World Order. What, you say, is the Committee of 300? Most people have never heard of this very occult, and very powerful, organization. The Committee of 300 is the ultimate steering committee of any organization. They are carefully screened and selected for their "worthiness" to sit on this committee. Former Satanists have told me that Queen Elizabeth II is the titular head of the Committee of 300, while Prince Charles is the actual leader. Notice that Cohen states what we are increasingly becoming aware of in America, i.e., that Great Britain really controls this country! See our NEWS2307, "Obama and McCain Are 22nd Cousins of King Edward I of England! ", a report on the shocking reality that "every presidential candidate with the most royal genes and chromosomes has always won the November presidential election". "This country is more of something resembling an American monarchy than most people have given thought to ... George Herbert Walker Bush has three lines that go back to King Edward I of England. He also is descended from King Henry I and King Henry II, both of England, and William I and Robert II, both of Scotland. Bush has common ancestors with 15 American presidents: Washington, Fillmore, Pierce, Lincoln, Grant, Hayes, Garfield, Cleveland, both Roosevelts, Taft, Coolidge, Hoover, Nixon and Ford." "Other presidents who have connections to British royalty are George Washington, the two Adamses, Millard Fillmore, Rutherford Hayes, Grover Cleveland, Theodore Roosevelt, William Taft, Woodrow Wilson, Calvin Coolidge, Franklin Roosevelt, Harry Truman, Richard Nixon and Ronald Reagan." "Mrs. Ronald Wilson Reagan is descended from Henry I, king of France, and Henry I, king of England. Mrs. George Herbert Walker Bush is descended from Henry II, king of England, and other notables. There are other royal descents of first ladies but these will serve as examples." "George Herbert Walker Bush has kinship with Presidents Nixon, Taft, Hayes, Pierce, Coolidge, Hoover, Franklin Roosevelt, Grant, Ford, Cleveland, Garfield, Washington, Fillmore, Theodore Roosevelt, Lincoln, John Quincy Adams, and John Adams Jr."
That is Generational Witchcraft, and it is propagated through secret societies like the Order of the Garter and Skull & Bones, to mention just two. Now, let us return to the "Antichrist and A Cup of Tea". How powerful are these knights, anyway? Notice Cohen warning that these leaders routinely make a "pretense of being a Christian", but are really practicing Satanists! 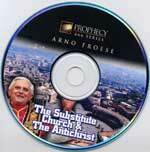 The DVD, "Riddles In Stone: The Secret Architecture of Washington, D.C.", goes to great lengths to prove that our Masonic Founding Fathers practiced the occult art of spiritual deception by pretending to be Christian while their inner heart beat with the occult values of their 'Invisible Masonic Lodge'! This spiritual deception is quite shocking and revealing, as you realize that Great Britain's Mother Masonic Lodge directed the American Founding Fathers to perfectly implement the plan of Sir Francis Bacon and Queen Elizabeth I to found the American government in such a way as to lead the world into the global government, economy, and religion and then stage their Masonic Christ (Antichrist). And, if you do not believe this fact, you can see this plan in the "Secret Architecture of Washington, D.C.". You will be especially interested in how the staging of Antichrist is etched into the buildings and the architecture and the street layouts of our nation's Capitol! And, this history all dates back to the Order of the Garter! Not only was Prince William born 21 June 1982, but he was made the 1,000th member of the Order of the Garter on 16 June 2008! Isn't it interesting that the man we believe is the future Antichrist was precisely the 1,000th member of the Garter! Prince William had to become a member of the Order of the Garter if he was going to one day become the Masonic Christ, also known as Antichrist. His family possesses the right pedigree, the right symbolism and the right genealogy to have Antichrist come out of their ranks. Since we expect 2012 might be the logical year for Antichrist to arise, and since we expect Prince William to be the "Man of Sin", we should not be too surprised to learn that Prince Charles and Queen Elizabeth II have created a very special training course for William to teach him how to be King. The most interesting fact is that this type of training has never, ever been undertaken in all England's history! "PRINCE William is to be given an astonishing apprenticeship in how to be king ... The Queen and Prince Charles have drawn up a secret two-year intensive training programme which he will start when he quits military life in the New Year. A senior royal aide confirmed last night: 'You could say he'll be the first person to ever get an apprenticeship in Kingship'." Why would Prince Charles and Queen Elizabeth II feel it necessary to create a historically unprecedented "apprenticeship in Kingship"? Why, after 1,000+ years of English history would the reigning Monarch and her prestigious son, decide that this young Prince needed an apprenticeship program training him to be King? The answer may lie in the fact that this training program is not designed to train him to be King of England, but King of the World, the Masonic Christ, the one whom the Bible will call Antichrist! Granted, this theory is speculation, but I believe it to be calculated speculation. Being King of the World will be a far more daunting task than just King of Great Britain. This global king will have to learn how to successfully deal with widely divergent cultures from all around the world. He will have to be thoroughly trained in how to not anger individual rulers from many different cultures throughout the world. 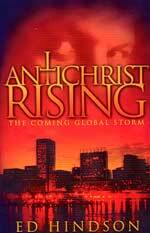 The Bible says that Antichrist will unite all government rulers throughout the world. This prophecy means that he will possess a incredible ability to overcome traditional barriers of culture of the 160+ individual nations of the world. This training program, coming just four years prior to 2012 when I expect Antichrist to arise, tells me that we should not ignore this unprecedented "astonishing apprenticeship in how to be king". Young Prince William will have to be matured far beyond his biological age of 30 years in 2012 is he is to be the Masonic Christ. Anytime after he turns 30, he can assume the Jewish mantle of Messiah! Truly, the End of the Age is coming upon us, rapidly. Are you spiritually ready? Is your family? Are you adequately protecting your loved ones? This is the reason for this ministry, to enable you to first understand the peril facing you, and then help you develop strategies to warn and protect your loved ones. Once you have been thoroughly trained, you can also use your knowledge as a means to open the door of discussion with an unsaved person. I have been able to use it many times, and have seen people come to Jesus Christ as a result. These perilous times are also a time when we can reach many souls for Jesus Christ, making an eternal difference.